Apples may be said to be to other fruits what potatoes are to other vegetables. But what do we know about apples? For instance, what makes them hard? Grate and squeeze one as you did the potato, and you will know. So much juice must mean that the apple is full of water. Test it for starch (p. 61). Taste it. It tastes both sour and sweet. What two substances must it contain? In talking of the pulp of the apple, as the mass of juice-filled cells is called, we must not forget that this grows simply as a covering for the seeds. Some fruits have stones enclosing their seeds. How many stone fruits can you name? In some others the seeds are scattered through the pulp. This is true of some foods not commonly called fruits; for example, the tomato, the squash, the cocoa bean. In the broad sense, all seed-vessels are fruits. This definition covers nuts, grains, and many vegetables; but we commonly class as fruits those seed-vessels eaten with sugar or as a dessert; and as vegetables, those served with meat or in salads. Fifty years ago, when it was the custom to eat tomatoes with cream and sugar, they were doubtless considered fruit. The edible portion of most fresh fruits contains from 80 to 90 % of water and considerable cellulose. They have almost no protein nor fat, and, when ripe, little or no starch. Ripening changes their starch to sugars and gums. Many fruits and some vegetables contain "pectin bodies," resembling carbohydrates. Whether these have any food value is not known. (See Pectin, pp. 304-305.) Sugar is the only foodstuff found in any considerable quantity in fruit. Apples, cherries, pears, peaches, and oranges contain, on an average, about the same amount of sugar (7 to 14 %); lemons, cranberries, and currants, less; grapes, and bananas, and dried fruits, more. Excepting bananas, fresh fruits have little fuel value. We eat them for their delicious taste, their refreshing, thirst-quenching juices, and the important mineral compounds they supply, including those of calcium, magnesium, potassium, phosphorus, and iron. They are base-formers, and so help to prevent bad results from eating meat. (See p. 143). 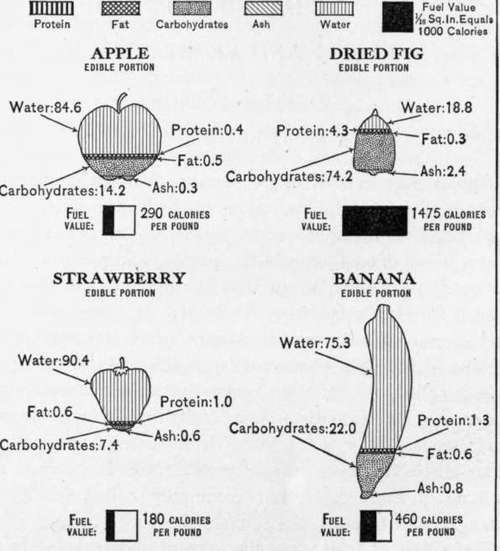 Bananas contain more carbohydrates than other fruits do. In ripe bananas these are mostly in the form of sugar and gum, but the bananas in our markets, like all fruits sold far from where they are grown, are picked green, and never ripen as perfectly as they would on the tree. In this condition they contain considerable starch, and, therefore, need cooking to develop all their food value and flavor. Some fruits grown in the South and Southwest are rare in Northern markets. Among these are fresh figs. These are. peeled and eaten with or without cream, or are made into jam. Guavas, and loquats, a small downy yellow fruit, are eaten either raw or cooked. Logan-berries, a California product, are a cross between raspberries and blackberries. They are very acid, but make good jelly. Some pineapples come from Florida, but more are imported. Pineapples contain a digestive ferment.